Don't use stock standard behavioural interviewing questions. Our system generates behavioural interviewing questions unique to the candidate and job role which are based on the applicants answers to our SmartQuestionnaire. This enables the interviewer to facilitate an honest two-way discussion that uncovers the likely fulfilment of needs, expectations, and goals of both the employer and candidate. Top candidates usually have multiple employment options. In this era of talent wars, it is essential employers quickly identify top talent and build strong positive relationships. Most interviews are conducted on a basis of screening out candidates. The interviewer typically asks the tough questions with an attitude of "are you good enough for us?". However, this has an unintended consequence of turning off the best candidates or at least starting the employment relationship on the wrong basis. The best candidates make employment decisions based on whether they think the employer will meet their needs and when the interview only focuses on the employer's needs, it demonstrates that their needs are not considered important. 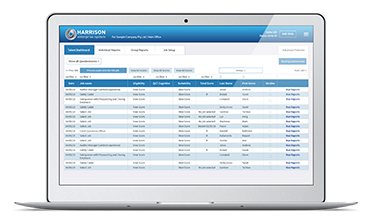 The Harrison system is designed to create a great candidate experience and "screen in" the best candidates, starting from automated pre-screening right through to the behavioural interview. 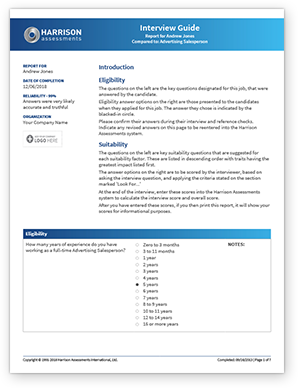 Since the Harrison Suitability Questionnaire is designed to assess the mutual needs of both the candidate and the employer, it enables the interviewer to address the candidate's needs and have an honest discussion to determine if mutual needs can be met. The interviewer can build rapport and organizational credibility by giving importance to the candidate's needs. This approach demonstrates to the applicant that the organization genuinely considers the candidate's needs to be important. The Harrison method includes job specific behavioural interviewing questions that are tailored to the individual candidate's responses to the job specific factors. It enables the interviewer to ask behavioural interviewing questions in the context of establishing mutual needs. We provide behavioural interviewing questions and tools that transform the interview into a highly productive and honest discussion which results in the acquisition and retention of top talent.